A favorite annual show and tell, Rolla Bee Club members bring in their honey samples to taste and vote on their favorites. Not sure what to bring to an upcoming meeting? 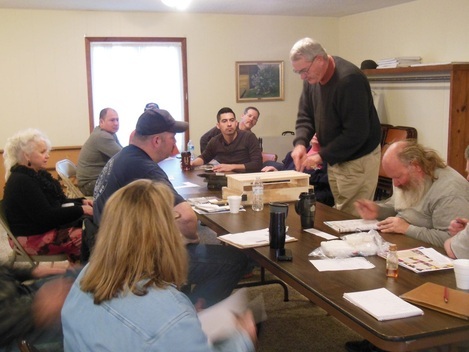 Sharing information at Rolla Bee Club meetings can be as simple as bringing in a photo of an interesting frame to bringing in a homemade top bar hive. Beekeepers have also brought in demonstrations of how they did something to sharing the year's bounty in our annual October honey tasting. You can also welcome to bring in questions, we are here to help you and to share information and experiences. 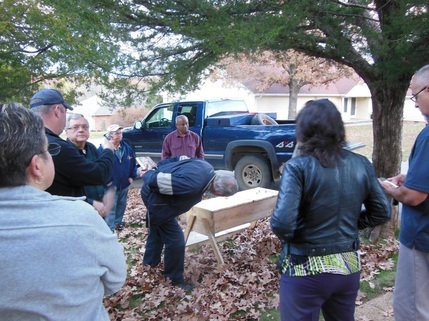 Rolla Bee Club members November 2014 look at a homemade top bar hive. Jim Roe demonstrates how he quickly puts together several bee hive frames at January 25, 2015 Rolla Bee Club meeting.